My Very First Blog: Nicki Minaj - Mariah Carey Feud Escalates On American Idol! Nicki Minaj - Mariah Carey Feud Escalates On American Idol! So, the rumors about the feud between rapper Nicki Minaj and singer Mariah Carey appears to be true after all! 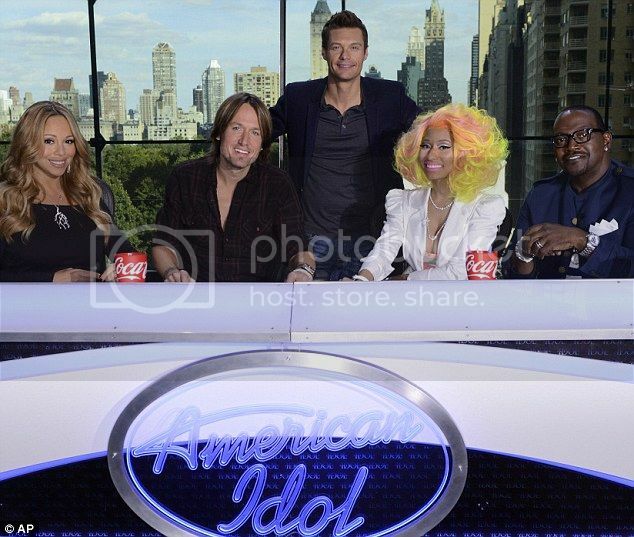 In case you do not know, both Nicki and Mariah are now sitting on the same panel of judges for the 12th season of reality singing show American Idol. The other two judges are Keith Urban and Randy Jackson. How do I know that the rumors are true? Well, the fight between these two divas became so bad that the production of American Idol came to a halt in Charlotte on Tuesday when foul-mouthed Nicki Minaj unleashed a tirade of jabs and curses at Mariah. The proof? Someone actually recorded a video of it and TMZ posted it online. Not sure if it's still available now, but hopefully you can still watch a portion of it below. It is difficult to hear what Nicki and Mariah said in the video but here's what was translated from one source. I think Nicki mostly drowned out Mariah's voice so we could not really hear what Mariah was saying. Nicki : I'm gonna knock you out! Nicki : Get this s**t in control. Get in control. Get in control. Randy : Settle down, settle down. Nicki : Don't lose your head. Don't lose your head (inaudible). Don't tell me I'm a gangster. Nicki : (inaudible) Every five minutes. So every time you patronize me, I'm a-take it back, and if you've got a f***ing problem, handle it. Nicki : I told them I'm not f***ing putting up with her f***ing highness over there. Figure it the f**k out. Nicki : Figure it out. Mariah : Do I have a 3-year old sitting around me? Nicki : I'm not gonna sit here every f***ing minute to have you come down and harass me every minute, every day. Mariah : Listen .... I can't see my kids because you decided to make... to have a little baby fit and going all around the stage. Nicki : Good, go see them now... go see them now. You're boring as f**k.
And guess what? Poor Keith Urban was sitting in between these two feuding divas. I feel sorry for him! Wonder what will Nicole Kidman (Keith's wife) advise him in such a situation? LOL! The video was presumably taken right after the two divas started to have a heated disagreement over a contestant's performance. And the exchange of words went so out of control that producers had to shut down the audition for the day even though there were some contestants left! Judging from the limited exchange of words above, who do you think were at fault? Who started the argument in the first place? When Mariah was first paid a stunning USD18 million to be a judge on American Idol, she had no idea that Nicki would be joining the show as well. It was reported that she was upset when she heard that Nicki was hired. No idea what came between them, but two years ago, Mariah actually collaborated with Nicki on a music video for Mariah's song Up Out My Face. Watch it below. Although I am a huge fan of Mariah, I am not going to side with her based on this limited information. I also happen to like some of Nicki's songs though I think she's more of a rapper than a singer. But, Nicki just simply disappoints me with her foul language and horrible manners. I mean, even if Mariah did say something that hurt her feelings, couldn't she at least show some class? Oh well, I guess all these feuding might just help American Idol in its ratings. Or it might not. Whatever happens, I can't wait to watch the next season of American Idol!